The Midwest can be threatened by a variety of disasters, ranging from heavy rain storms, flash floods, straight line winds, to blizzards. When you are facing property damage, give Werner Restoration Services a call! Here in the Midwest, tornados and straight-line winds are very real natural disasters that occur in our area every year. The Midwest region has severe spring and summertime storms that can sometimes bring unexpected wind and storm damage. In 2008, straight line winds came through the Quad Cities leaving a disaster behind. Werner Restoration Services was here then, and we are still here today. 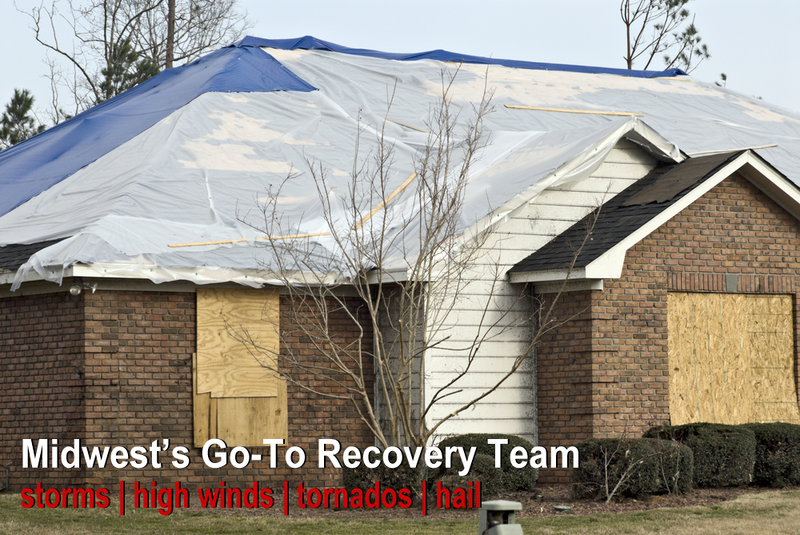 We specialize in securing your home and helping you pick up the pieces after a disaster. Call us today for an estimate and start putting the pieces back together in your life. Your home or business will need to be secured so that further storm damage will not incur. With our Temporary Board Up services, we will be onsite within 1 hour to secure your property. We will begin clearing debris away from the affected areas and secure your windows and doors from additional damage due to rain, snow, or vandals. Werner Restoration will provide temporary roofing repairs and tarp areas of your roof or home that were affected by a storm. Storm damage that causes trees to fall, shingles to tear away, or extremely heavy snow to collapse into your home or commercial property needs to be dealt with right away in order to not incur additional damages. Damage to your home or business from storm damage, flooding, or water leaks could lead to structural damage on your property. Structural water damage can include your roof, attic, ceilings, walls, floors, carpet and padding, garage, basement, and/or other areas to your home or commercial property. Immediately beginning the drying process will reduce the potential of mold and mildew growth on your belongings. Clothing, upholstery, furniture, and other materials can be dried in place with proper air flow, dehumidification, and monitoring. Electronics can be restored with the use of our technology and specialized drying chambers. Extracting water immediately due to storm damage, flooding, or a burst pipe is crucial to stop the further spread of water and moisture to other areas of your home or business. Damaged materials such as insulation, ceiling tiles, dry wall, and other absorbent materials will have to be removed. In many cases, carpet and padding will be removed and disposed due to the type of water damage that has occurred. If the latex backing hasn’t incurred too much damage, we may be able to dry them in place. Our professional water damage professionals will assess the damages to update you in real-time. Werner Restoration Services is your premier restoration company trained in drying and dehumidification process to get your home or business back to pre-loss condition. We have invested in the latest drying technologies and equipment, including a specialized infrared camera that can track moisture in most situations.